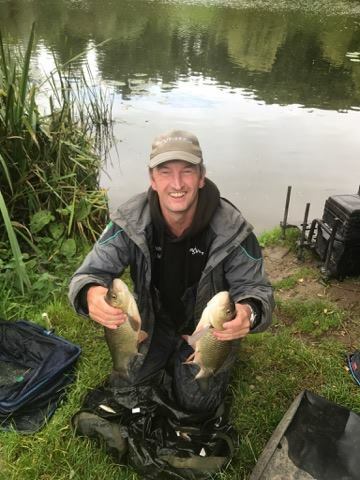 It was back to Dillington for the final Summer League match on Sunday and there were three anglers in contention for the title, Bill on 10 points, Fieldy on 14 and John D on 15. The Paste King had that four point buffer and just needed to avoid a blow out today, which on current form was highly unlikely. I paid Karl my pound from the other week and we agreed to have a nugget today as well. After another lovely breakfast, Hurf announced the draw and with Nick bagging up on peg 2 in the week, that was most peoples first choice. I also fancied peg 1 but also wouldn’t mind peg 4, 13 or 14. In a complete change to my usual drawing technique, I went in first (I knew the winning peg was in there somewhere) and slowly opened my fingers, it wasn’t peg 2 but I was fairly happy when I saw the number 4 staring back at me as Frank had won the last match there with two bream and a skimmer for 10lb odd. 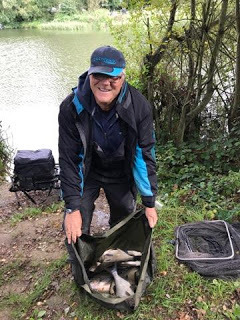 Bill had drawn peg 2 and there would be no catching him now, Fieldy was on 20 with John D on 19 so it would be next peg battle for the runners up position. Rob was on peg 1, Bob on 6, Steve P on 7, Hurf on 8, Big Frank on 9 and Karl on 10. Along with Karl, I also had side bets with Rob, Hurf and Steve P so it could be an expensive day! My peg looked really good with lilies and reed beds to the left and right and I was intending to spend most of the day fishing for big fish. On the whistle I cupped in two big pots of casters, corn and hemp on both the longer lines before starting with the top two to hand rig, feeding a few casters and a little nugget of groundbait. I had a couple of small roach on single maggot so switched to caster and had a couple of better roach but it certainly wasn’t fast or furious and after three quarters of an hour I had 16 fish for a pound or so and to be honest I was itching to go out on the big fish lines. Elsewhere in my section, Hurf had landed a couple of nice perch, Steve P had a bonus tench and Frank had netted a couple of fish on the feeder. I slipped on a grain of corn and filled the toss pot with casters and hemp before shipping out and starting on the left hand line. There were odd blows coming up and I felt sure it would only be a matter of time before the float slid away as a nice bream took the bait. Half an hour passed without a proper indication and I was just thinking about putting some more feed in and trying the other line when the float sailed away and I missed it! My hope that they’d arrived soon faded when a further thirty minutes passed without any more bites. I cupped in some more feed before going over the right hand line, this time a positive bite came quite quickly and I bloody missed that one as well, the same thing happened next chuck but at least there were a few fish there, I shipped out again, determined to hit the next bite but this time the float just sat there! I put some more feed in and went back over the left hand line, I had two fantastic bites where the float dipped and held there before sliding away and I missed both of those as well! It was also raining and a blustery wind was making presentation difficult. As we passed the half way mark, I hadn’t added anything to my early pound of fish and from feeling fairly confident, I was now pinning my hopes on a few fish showing in the last hour. 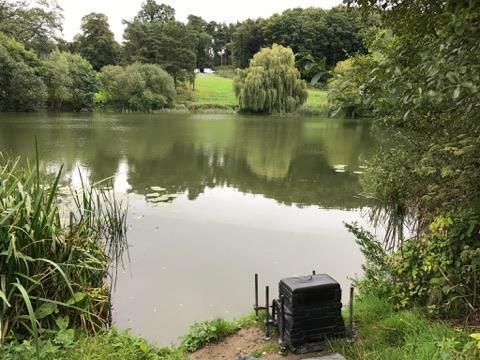 Karl turned up and said he’d only had a couple of pounds and that apart from Adie on peg 14 who had caught seven skimmers early on the feeder, nobody was catching much. I tried double caster and had a few small roach, one of 4oz and a chublet of 8oz or so but I was going nowhere fast and still felt I needed big fish to do any good today. 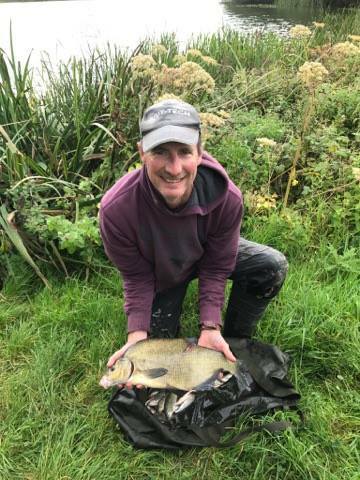 Rob also came for a wander and said he’d had one chub but had lost two under the bush in peg 1, he also reported that Bill had caught a decent bream plus skimmers and John D was getting a few as well. I missed a couple more really good bites and with only an hour and a half left, not only was it looking like my bad run was going to continue, there was also going to be a queue of people waiting to collect pound coins from me! Then the float sailed away on the left hand line and this time I did connect with it, this was a good fish and the way it was fighting, I knew it was no bream, mindful of the lilies, I played the fish on the long pole until it surfaced and it was a big chub, I unshipped a section at a time before slipping the net under a four pounder, this was more like it! I fed that line again before going over the right hand line and the float barely settled before sliding away and chub number two was on, this one around 3lb and I’d gone from nowhere to 7-8lb in two chucks. I shipped back out and the float’s disappeared again, this time the chub made a beeline for the sanctuary of the lilies on my left and it all went slack, I was convinced it had snapped me but the hook had pulled out. On the next put in, the float has buried but this time it was another 8oz chublet, out again but this time I hooked a beast that went off at a rate of knots, through the lilies and this time, it did snap me! Time was running out so I went back out on the right hand line but after all the commotion, it went a bit quiet, I managed another chublet from the left hand swim but with ten minutes left I was praying for another chance but it didn’t happen and I’d made a right mess of it today. I’d had more than my fair share of chances today, six bites missed on corn followed by six bites hit on corn (how does that happen?) and 6-7lb of chub left in the swim, why, like an idiot, didn’t I step up the hooklength and elastic after I’d lost that fish? 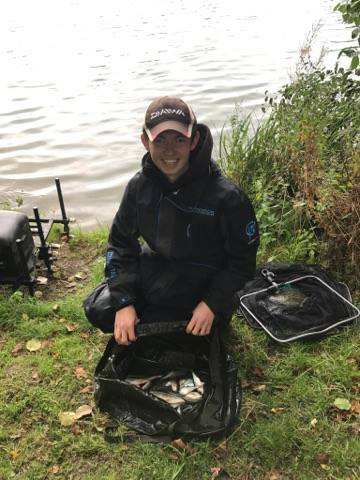 I packed up and went to give Steve a hand with the weigh in and get some photos, Rob didn’t weigh in peg 1 and then Bill had another nice net of bream and skimmers weighing 15lb 8oz which would secure the league title. 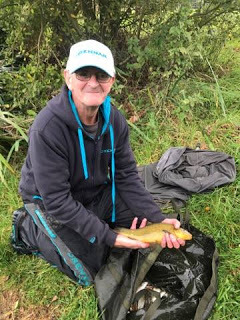 Then it was my turn and I was surprised when the needle stopped at 9lb 8oz and those two lost chub had really cost me, Bob had only caught a few bits and chucked back, Steve P had 4lb 8oz which included a lovely little tench and then Hurf had a big bream plus some perch and roach for 7lb 7oz, Frank had three skimmers for 4lb 2oz and Karl had 2lb 13oz so if Bill framed, I’d sneak the section by default. Back at the results and Fieldy had won the next peg battle with John, but only just, 10lb 13oz to 10lb 6oz which meant he’d held on to second in the league behind Bill. I ended up winning my section and £20 plus a clean sweep of all four side bets but I was seriously gutted, opportunities to win matches don’t come along that often so you have to make the most of them when they do and I haven’t today. It wasn’t just the two lost chub, which was bad enough, any one of those six missed bites would have been enough for second place. 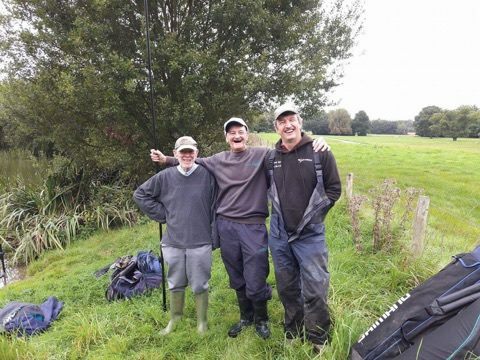 Last but not least, a massive thanks to Rob Cox and Steve Hurford for running another great league, Ilminster Bowling Club for looking after us so well and to all the anglers who make it so enjoyable to fish.